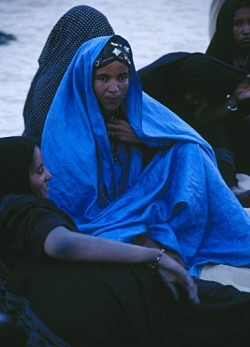 Simply, the Tuareg, though they do not call themselves that, are a nomadic tribe of the Sahara- living mainly in Niger and Mali though many exist as refugees in Libya and Algeria. They are called the Blue Men of the desert. Why blue? They are recognized by their cloth, dyed a beep blue from the indigo plant. This dye is pounded into the cloth, instead of boiled. When it is worn, it stains the skin of the wearer over time. The Tuareg consider this stain beneficially cosmetic, and lovely. "Tuareg" is not the name these people use to refer to themselves. Tuareg is an Arabic word meaning, "Abandoned by the Gods." The people refer to themselves as Imouhar(en), or Kel Tamasheq ("Kel" meaning "of" and "Tamasheq" referring to their language), or Imashagen (meaning "free" or "noble" in Tamasheq). The Imashagen are not Arabs, they are a part of the Berber people. Before being forced from their feudalistic way of life, the Imashagen were the lords of the desert. Their caravan routes through the sands carried salt, slaves, and gold. This poetic race shunned modern weaponry, favoring what they viewed as a more honorable, personal way of fighting with sword, knife and shield. Now, the railroads and colonization have forced the Blue Men the settle. Socially, the Imashagen are a fascinating people. Their culture is matriarchal/ matrilineal. Rank and wealth is passed through the mother's line and women are quite independant. Women study poetry and song and are expected to do little manual labor--Imashagen women have been some of the desert's most inspired poets. Music in Imashagen camp is often simple--a poem sung to the accompaniment of an amzad. The amzad is a single stringed instument, the base is typically made from a gourd. The amzad is played only by the women. When a girl crosses the threshold into womanhood, she is given, by her mother or another female relative, a Khommisar pendant. The khommisar is made of five diamonds, stacked three on the bottom, two on top. This symbol is a stylized khamsa ("khamsa" means "five" in most Arabic dialects), better known as the Hand of Fatima, an ancient symbol of protection. Incidentally, the men wear the face-veil in Imashagen society. It is considered a sign that he has reached manhood. Unless he is with his own family, an Imashagen man will not remove his veil, even to eat. Women wear a gauzy material similar to a veil that wraps their entire body--comfortable in the desert heat and offering protection from the all-invasive sand. One end goes over the head and is flung over the shoulder where it is held in place by a decorative weight, often intricately made of layered iron, copper, wood, silver, and brass.